Summer 2009, and eleven-year-old Jason Lowry is preoccupied with thoughts of the Da he has never known. In the meantime, his vodka-swilling, swings-from-the-hip Ma is busy entertaining her latest boyfriend and indulging her fondness for joyriding. Jason escapes to the Swamp: a mysteriously rising pool of fetid water on the outskirts of the town. There, he meets the girl, a being as lost as himself, and with even less regard for reality. Together, they conjure exotic adventures – from ancient Egypt to the search for Ithaca, home of Odysseus. But what begin as innocent flights of fancy soon become forays into hazardous territory; the girl is a dangerous (and very committed) partner in crime. Provocative, sharply witty and rather beautiful, Ithaca is a breathtaking read. Compelling from start to finish. Read it. 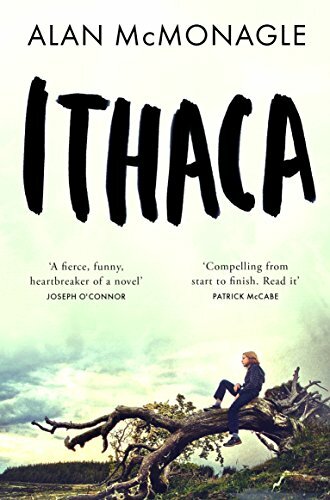 Strange and wondrous; savage with vision, leaping with wit and moving in ways that are quite impossible to shake off, Alan McMonagle's Ithaca is a stunner. A fierce and funny novel that tackles tough topics with great imaginative flair. Ithaca doesn’t take itself too seriously, and is all the more affecting for it . . .